Stacy’s Video Diary Jac-Episode 32-Using horse shows and trail rides as training. The goal for Jac’s first horse show wasn’t to win a prize, the goal was to use the whole experience as a learning and training session. The atmosphere is a lot of the training; many horses around, warm up pen, bathing, riding, preparing, walking into the pen alone, odd hours, etc. Gathering information is key to predicting how a horse will handle future experiences. By making the first several trips to shows very low pressure the horse is more likely to have a positive experience. The learning that takes place at a show is not only the horse. The rider also learns how to better prepare and show the horse. 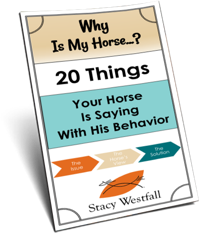 I answer a question about my goals when taking a horse to a show or a trail ride for the first time; what types of things do you do to ensure a good experience for the horse. I explain that many people ride their horses harder at a show or when they haul them somewhere than they do at home. When this happens the horse learns to expect hard work when they are hauled. I ride my horses harder at home than I do at the shows so that the horse learns that traveling doesn’t require more work. Could you explain how you taught him to do flying lead changes and I always hear that in order to have a good stop you should do fencing with your horse. Did you do that with Jac to get that good stop? Looks like both Westfalls are off to a good start with their “Legacies”. Way to go Stacy and Jac and Jesse and Lucy!! Another great video, thanks Stacy. The gate latch is very impressive also, I will be copying that one. Very nice! 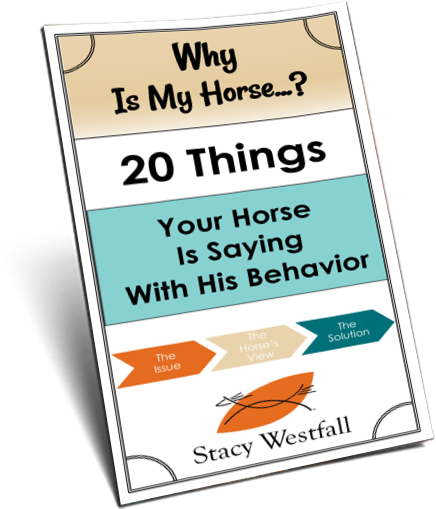 He was so nice and laid back:) This is such an important step…I do have a question….my gelding is pretty wired at a show. He requires a lot of loping to get the edge off in order to listen to me well.. ….I am still in the rookie and green classes, so I don’t ask a lot of him in the ring, but I do end up loping him down more than I do at home. Any advice on a more “nervous “horse? He is improving as we go along, my trainer says I need to remember to “be the pilot” to get him through any spooks….. Loved it………man he is smooth…….. but you really seemed very “serious” in this video……. hmmmmmm game face maybe?? ohhhh ok….. hope you feel better soon….. maybe it was the weather change from Texas back to Ohio…. now you will have to deal with all the pollen!!!! ugh! !